There are times when instead of using headphones, you want your music—or your audiobook, podcast, or movie audio—to fill the air in your general vicinity. For that, you need speakers. But what if you don't want to lug around a bulky audio system? I rounded up six speakers that you can stow in your bag and carry with you anywhere. At first glance, the iMainGo 2 looks exactly like the original iMainGo ( ). Its 5.7- by 3.8- by 2.4-inch dimensions are practically identical to its predecessor's, with a compartment on one side for your iPod or iPhone, and the amplifier, the speakers—titanium, a change from the old model—and batteries (four AAAs, included) on the other side. You plug the included cable into your player, close the iMainGo 2 with a zipper, and you’re ready to go. The iMainGo 2 has everything we liked about the iMainGo. It’s sturdy and provides iPod protection, and the speakers are quite good-there’s a surprising amount of bass thump, and midrange audio has good warmth. On the other hand, the iMainGo 2 can't quite product the highest frequencies, and there’s a noticeable amount of distortion if you crank the volume all the way. In my testing, an iPhone, iPod touch, and iPod classic each fit comfortably into the iMainGo 2. You can also use an iPod nano, but the compartment is sized for bigger devices, so the nano doesn’t look as elegant when seen through the vinyl window. Speaking of the window, I inadvertently pushed the window out of place during testing. The glue used isn’t very strong; the window would be more secure if it were stitched in. Also, the battery door on my test sample kept falling off (since the door is on the inside of the case, there's little risk of your batteries falling out). Still, if you’re looking for a speaker case, the iMainGo 2 is one of the better ones we’ve seen, combining secure device protection with good sound. Measuring in at 5.8 inches long, 2 inches "tall," and 1.5 inches thick, the iSP100 include a pair of tiny speakers that use what iLuv calls “jAura sound" to create “Dynamic Stereo Sound.” In plain English, the effect sounds much like pseudo-surround-sound, similar to the popular SRS processing. Yet I found the iSP100’s audio to be somewhat flat—everything at almost the same layer, with no real background or foreground. I also found it hard to distinguish much stereo separation, and I heard some distortion at the low end, especially at louder volumes. On the positive side, midrange and treble sound nice, and the iSP100 is almost as good as the Orbit MP3 (reviewed below) at filling a small room. The iSP100 requires three AAA batteries and connects to your device's headphone jack using a miniplug-to-miniplug cable that's attached to the iSP100 and neatly wraps around the device when it's not in use. While the unit was designed to lay flat with the speakers pointing upward, it's easy to prop the device on its side so the speakers point at you. The iSP100 is a solid speaker that’s easy to fit in your bag or backpack. 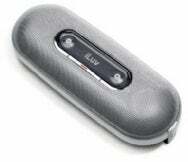 I reviewed the previous version (IM207) ( ) of Altec Lansing’s Orbit MP3 nearly a year ago. The new Orbit MP3 IM237 looks nothing like its predecessor, and it also fixes a few issues I had with the original Orbit. The Orbit is still a single round speaker that points upward. 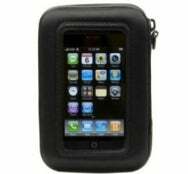 The enclosure measures 3.5 inches around, 2.1 inches tall, and uses a 3.5mm miniplug cable to connect to your iPod, iPhone, or any other device with a headphone jack. The Orbit uses three AAA batteries (not included). One major flaw with the original Orbit was that it didn’t have a way to tell if the device was on or off, making it easy to inadvertently leave the unit on, draining your batteries. The new orbit thankfully has a LED power indicator so you can quickly see if it’s on or off. The new Orbit also features improved sound, with a wider range than the previous version. The Orbit's strength is still in its midrange reproduction, but bass response is a bit stronger, and high notes are clearer. I also didn’t experience any distortion, even at the loudest volume. Of the speakers in this article, the Orbit had the best sound quality—surprising, given that it uses a single speaker instead of a stereo pair. The Orbit MP3 is a good option for filling a small room without having to carry a big system. 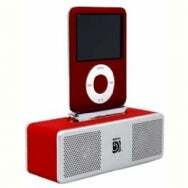 The Pocket Hi-Fi is a portable speaker stand measuring 4 inches wide, 1.4 inches tall, and 1.4 inches deep. Unlike the other speakers here, the Pocket Hi-Fi connects to your iPod's dock-connector port and charges your player when the speaker is powered via USB or the included AC adapter. (Unfortunately, you can't sync your iPod with your computer through the Pocket Hi-Fi.) The Pocket Hi-Fi uses a single AA battery for portable use. You can connect other audio devices to the Hi-Fi's 3.5mm auxiliary-input jack using the included miniplug-to-miniplug cable. Usually with speakers this small I don’t expect a lot of power, but the Pocket Hi-Fi has a surprising amount of oomph. Still, the sound quality is like that of a good pocket FM radio: not a lot of bass or treble extension, average midrange, and not a lot of warmth. And when using an iPod touch, iPhone, and iPod nano, I heard interference during the silence between songs. 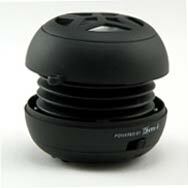 Much like a roly poly, the X-mini forms a protective ball for travel, opening up when it's time to get down to business. When in its travel-ready form, the X-mini looks much like a tiny curling stone, just 2 inches in diameter—making it the smallest speaker in this group and one that's easy to fit into a pocket. With a slight twist, the X-mini's two halves move apart, expanding the speaker's “resonance chamber”—an accordion-like section in the middle. This chamber is designed to improve the speaker's bass response, but I didn’t hear a difference between the compact and expanded positions. The X-mini has a built-in rechargeable battery that charges only via USB (a retractable USB cable is included), which means you need a computer—or at least a wall charger with a USB jack—nearby when you need some juice. Fortunately, the X-mini uses a USB Mini-B plug, which is commonly used with digital cameras and other USB peripherals, so you can use other Mini-B cables to charge the X-mini. Unfortunately, despite the USB port, the X-mini supports only analog audio, which means you must use the X-mini's proprietary cable for audio connections. This cable has a Mini-B plug at one end for connecting to the X-mini, but the other end splits into a USB-A plug for recharging and a stereo miniplug for connecting your audio device. The X-mini Max is essentially a two-speaker version of the X-mini, allowing for stereo separation. 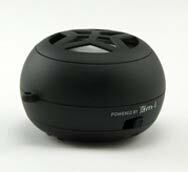 The bases of the two speakers stick together using magnets to create a barrel-like unit, 2 inches in diameter and 3 inches tall, that you can easily fit in a backpack or bag. 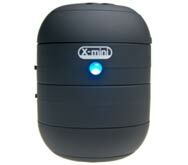 Like the X-mini, the Max has a rechargeable battery and charges only via USB. The Max includes a retractable USB cable for charging via its USB Mini-B jack (like the cable that comes with the X-mini reviewed above), but it has an additional cable to connect the two speakers to each other. That connector doesn’t retract, making for a dangling mess when you’re putting the speaker away. 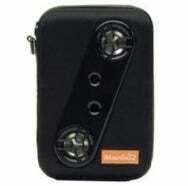 The speakers connect to your iPod, iPhone, or other audio device using a miniplug-to-miniplug cable.